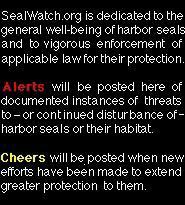 SEALWATCH.ORG - Heads Up Alert for Phocine Distemper! "Danish authority confirms new outbreak of distemper among seals"
The Phocine Distemper Virus epidemics of 1988 and 2002 killed many thousands of harbo(u)r/common seals in northern Europe. Both of these two outbreaks eliminated nearly half of the entire population in this region, while the second struck over 4,000 seals in the UK alone. The deadly virus strain has begun its devastation again. Frontline marine mammal rescue organizations are beginning to meet to plan their response as the disease spreads its possible contagion south from Scandinavia. These organizations and others like them deserve our financial and moral support in dealing with this potentially tragic situation. The disease initially causes pneumonia through an attack on the immune system and produces nerve damage. It rapidly progresses to a condition fatal to most animals affected. While humans appear unaffected by the virus, it is advised to keep dogs away from sick seals.